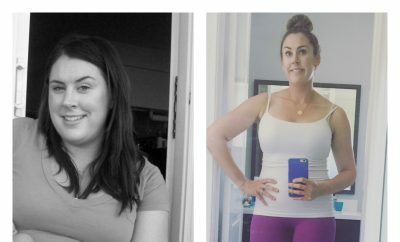 How I Gained It: I’ve always been overweight. I was heavy as a child, and I believe this had to do with the fact that I was raised in an abusive household. I ate to feel good; food was my comfort. My late mother often said that my middle name should have been hamburger because it, along with ice cream, candy, chips and soda, were the staples of my diet. I routinely binged on fast food, which I could easily wash down with a 2-liter Coke. I stayed heavy all through my youth, and by the time I was 20 years old, I weighed 300 pounds. Unfortunately, that was just the beginning — I kept ballooning from there. I have a family history of serious medical issues, but that didn’t make a difference — I ignored all the warning signs. If there’s one factor that I believe lead to my excessive weight, I think it would be my own self-image. I did not like myself, and it manifested itself in morbid obesity. Breaking Point: Dr. Phil McGraw has said many times, “When you chose a behavior, you chose the consequences,” and it took literally standing at death’s door for me to turn my life around. I was hospitalized twice, and on both occasions, it was due to severe complications from diabetes. Because of diabetes, I almost lost both of my legs, and I was forced to have wound vac therapy. I also had to take countless rounds of IV antibiotics. At one point, I was told I would never go home. The doctors informed me that I would require constant medical supervision in a nursing home for the rest of my life, and that was only if I survived the multiple surgeries I had to have. The second time I was in the hospital, I was there for four months. That’s no way to live, so I realized I had to do something. At that point, it really was a matter of life and death. 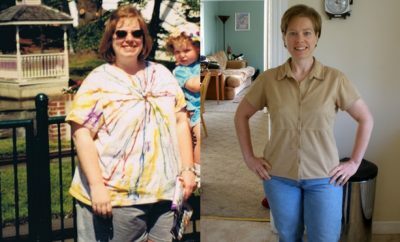 How I Lost It: As I write this, I have lost 230 pounds, and I’ve regained my life. I exercise twice daily, I live a healthy lifestyle, I work full-time and I live at home, which doesn’t sound like much to some people, but when you’re facing a life of hospital care, it’s a big deal. To lose the weight, I did a modified version of the Subway diet. I eat a 6-inch sub for lunch with baked chips and a drink, and a foot-long for dinner again with baked chips and a drink. That is all I consume each day. Eating the same thing every day can get boring, but having a strict routine helps me stay on track and makes food journaling and calorie counting very simple. I do crave other foods, but I carry before-and-after pictures with me and if the ice cream parlour starts calling my name, I look at those pictures and drive on by. I also exercise twice a day, seven days a week. I own a recumbent bike, and I ride it for two hours, 13.2 miles each session, which is a marathon each day. I am also looking into joining a gym and working with a trainer to get toned. Because of the toll morbid obesity took on my body, I’m facing at least one knee replacement, and I’m sure at my age I will require surgery to remove excess skin next year as well. As for the soda, ice cream and other vice foods, I no longer keep them in my home. Occasionally, when I’m dining out, I might treat myself to a light dessert, but I do not indulge in the foods that got me to almost 500 pounds. I do not feel at this time that I possess the control to allow myself any junk food — the temptation is too much. I like the regimen I now have, although I realize it cannot become a crutch I use for the rest of my life. I live alone, so this has been my private war. I had no one to encourage me along the way, even through my darkest days. I asked a friend if I could be accountable to him, but he soon lost interest. Even though I was alone, I knew I was faced with a choice, and I chose life. I believe that it really is as simple as the choices we all make daily. For the first time in years, I now have a normal life. I need only one airline seat, I can attend sporting events, I can shop at the same stores normal people do and I don’t require seat belt extenders. I am active in the church and outreach programs, and I’ve started dating. Life is good; I plan to live the rest of it to the fullest, each and every moment. 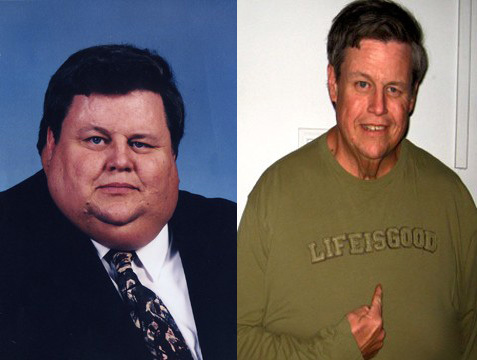 Ray has been losing weight for 18 months now and is still working on reaching his goal weight of 200 pounds.